Happy New Year everyone! I can’t believe it’s already the start of a new year. It feels like I was just decorating the house for Christmas and now this morning I put it all away. Although I will miss all of the decorations and lights it feels good to get everything cleaned up and start fresh! 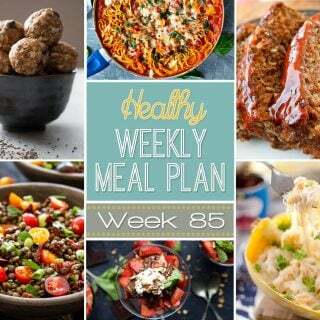 Speaking of starting fresh, that is exactly what I need to do with my eating habits. The month of December felt like one big splurge on desserts, not that I’m complaining, they were delicious. However, all good and decadent things must come to an end (or at least go back to being eaten in moderation). 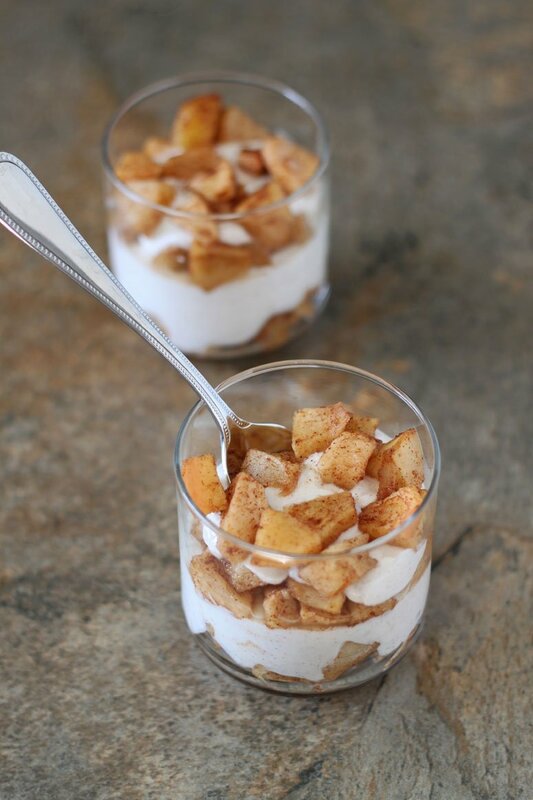 To ease back into more healthful eating I made this delicious cinnamon apple pear parfait. This parfait makes a great breakfast or dessert. It is moderately sweet, yet you are still getting plenty of nutrients from the fruit and Greek yogurt. To make the cinnamon apple pear parfait I started by peeling and dicing the apples and pear. I then added a tablespoon of brown sugar and some cinnamon to the fruit and tossed them around in a bowl. To make the fruit even sweeter and soften it, I roasted it in the oven for about 20 minutes. For the yogurt part of the parfait I took a cup of non fat plain Greek yogurt and whisked in a tablespoon of honey and a little bit of cinnamon. After the fruit had cooled I layered the fruit and yogurt in two small glasses. The result was a perfectly sweet and healthy parfait! I didn’t feel guilty eating this even though it tasted like it could be a decadent dessert. 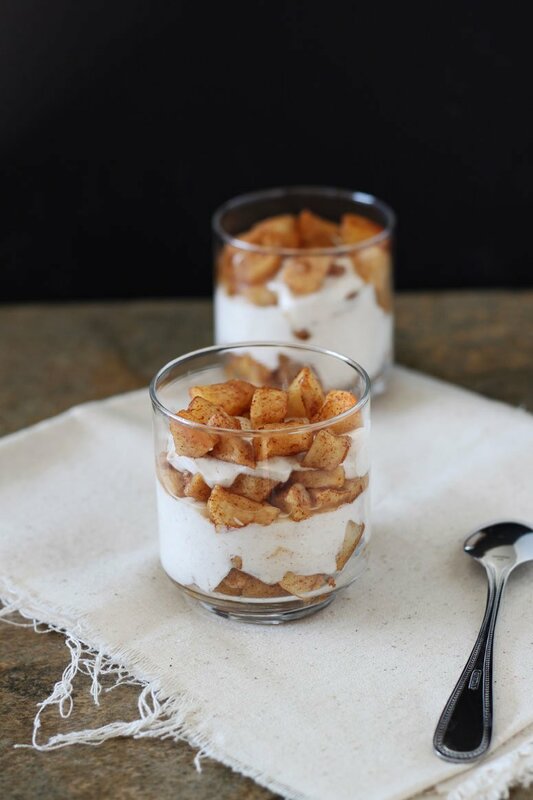 I loved the way the layers of the cinnamon apple pear parfait looked, it made me feel like I was eating something special and not just a bowl of yogurt with some fruit on top. 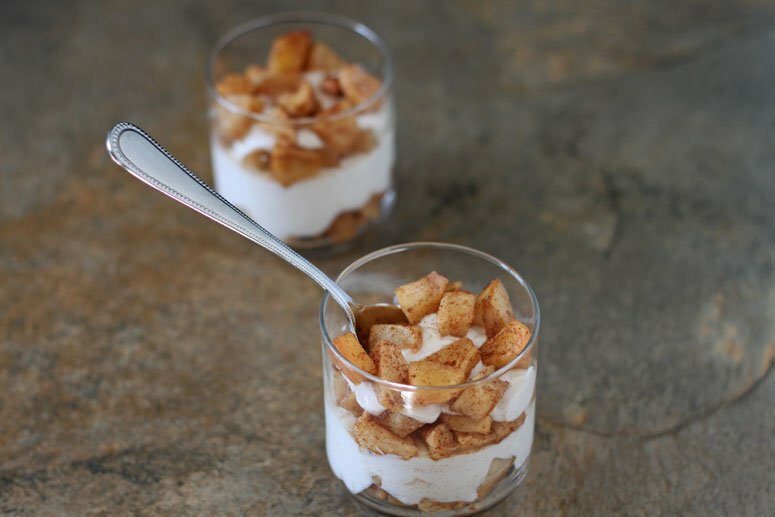 If you are like me and need to get your sweet tooth back in check try giving these cinnamon apple pear parfaits a try! Line a baking sheet with foil (sprayed with cooking spray) or a silpat mat. In a small bowl toss the peeled, diced apples and pear together with the brown sugar and cinnamon until everything is coated. Pour the fruit onto the lined baking sheet and bake for 20 minutes. When the fruit is finished roasting let it cool to room temperature or chill it in the fridge. 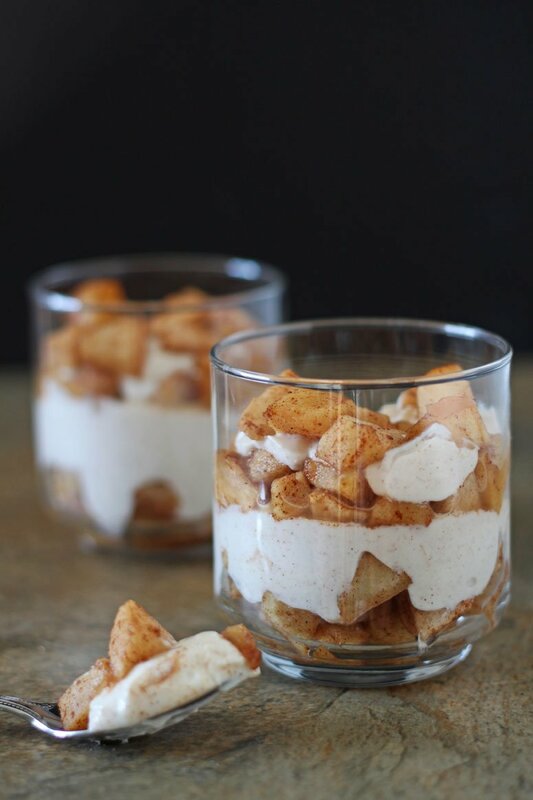 In a separate bowl whisk together the yogurt, honey, and cinnamon. Take two small glasses and put a layer of fruit on the bottom and top the fruit with a couple spoonfuls of the yogurt mixture. Continue to layer the fruit and yogurt ending with the fruit on top. 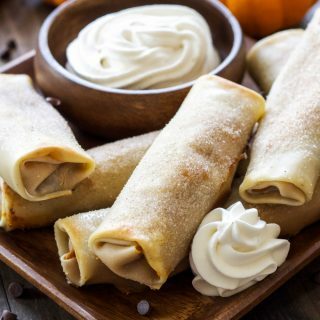 Serve immediately or cover with plastic wrap and refrigerate them until you are ready to eat. This is exactly what I need for the new year! It looks delicious! Thank you! It was the perfect healthy dessert I needed!